Just like Facebook, Twitter is one of the most popular social networking website. 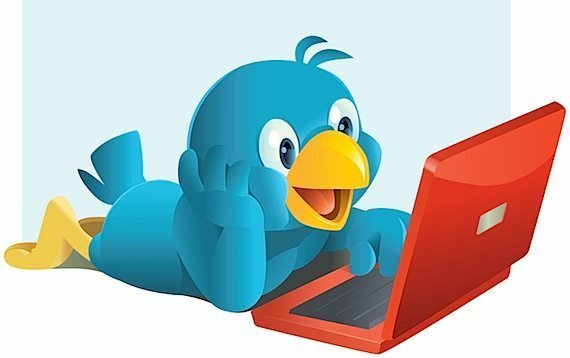 Although Twitter is not a new thing but this compiled list is for new bloggers as well business owners can get lot of information to boost their business online. All bloggers and website owners paying special attention on Twitter to promote and share stuffs with their friends. In this list, Copyblogger have collected a fairly valuable links of killer resources along the way, which definitely help you to start marketing your business on Twitter. After reading the resources, hope you want to enhance the Twitter experience with your website specially if you website or blog running on WordPress. Following are the premium plugins which help you to get more traffic by using Twitter applications. 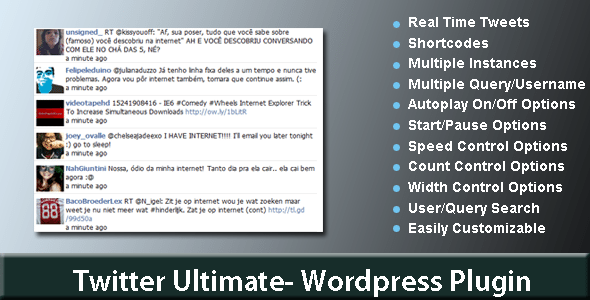 The Twitter WPress for WordPress enables you to use the power of the Twitter API , on your own WordPress blog . 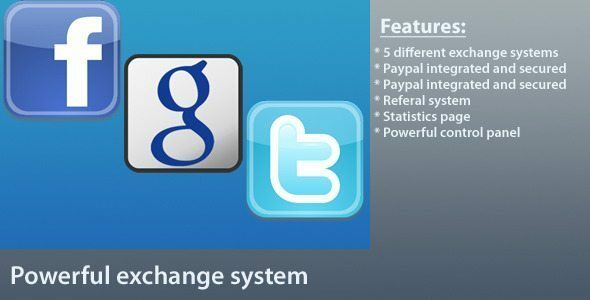 Integrate the Twitter connect, the signup process using Twitter. Store your users Twitter tokens and update their timeline later. Display Twitter widgets and buttons with powerfull shortcodes. Display Twitter friends and followers using the built-in widgets. Open you WordPress to the Twitter API ! Enables users to connect with their Twitter account. Enables users to create a WordPress account using their Twitter credentials. 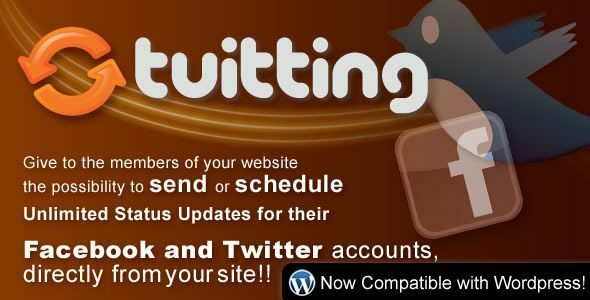 Enables you to link a Twitter account to your WordPress first admin user. Store the Twitter users tokens into the database. Ability to post updates to your users Twitter timeline (even if they are logged out). 4 widgets ready to be used (one for the Twitter connect, one to display Twitter friends, one to display the Twitter followers and one to display the last connected users). You can customize how many users are displayed in the widgets. Ability to display the Twitter connect button wherever you want in your theme(by adding a small PHP code provided in the documentation). Caching of Twitter API calls (set to 2 minutes). This is a native Web Mobile Twitter application. It works like a Twitter client and contains all the Twitter connect functionalities. It enables the users to view their Twitter timeline, @Mentions, Tweets and favorite tweets. It also gives the ability to users to update their Twitter status without leaving the app. Powered by jQuery Mobile Framework. Uses AJAX to load the content, without reloading the page. Display user’s timeline, tweets, favorites and mentions. More button to dynamically load more tweets. Ability to update Twitter status. Works on major Mobile devices (including iPhone, iPad, Android). Setup in less than 2 minutes and you get your own Twitter Mobile app. 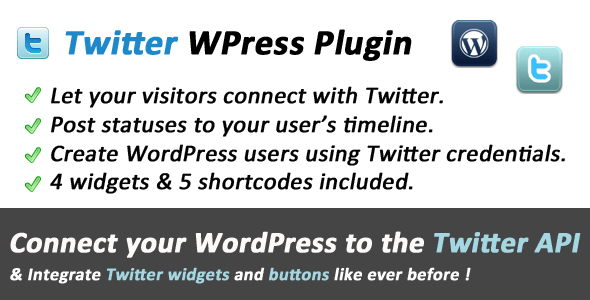 If you own just one twitter plugin for WordPress, let it be this one! 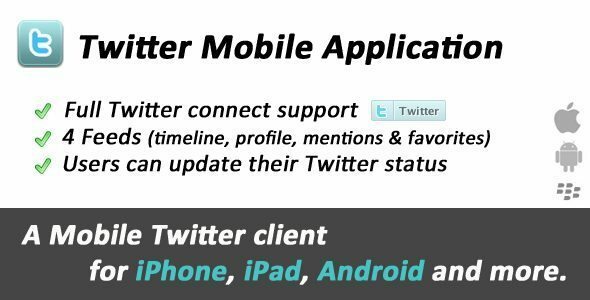 The only premium twitter plugin out right now – with support for multiple twitter users and includes a ton of premium options. This is the last Twitter plugin you’ll ever need! Include twitter avatars, names, times, and more in the options page! Ridiculously easy to use – install it in mere minutes (and that’s being generous! 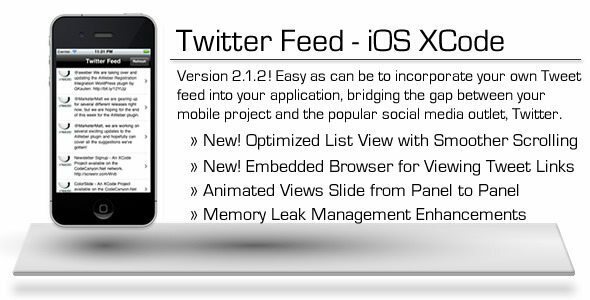 Twitter Feed is an iOS XCode project which illustrates the versatility of utilizing the built in URL request objects along with the XML parsing objects to perform GET transactions against the Twitter API in order to allow for retrieval of Tweets from a user’s timeline. 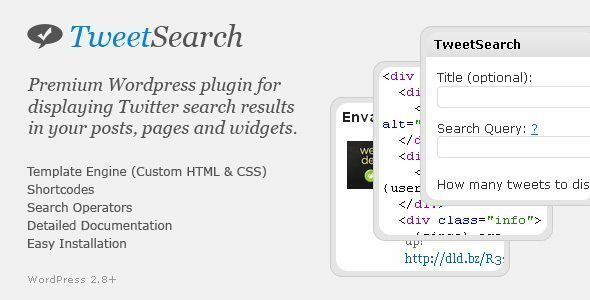 Premium WordPress plugin for displaying Twitter search results in your posts, pages and widgets. 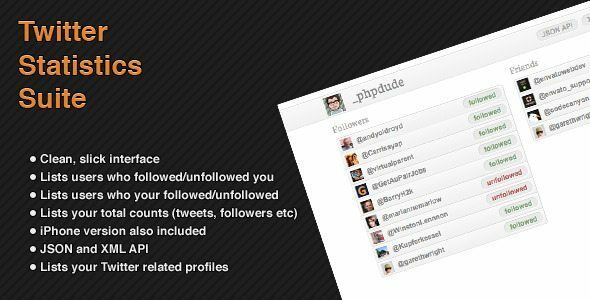 Twitter Statistics Suite lists exactly who has started following or unfollowing you, and who you have started following or unfollowing in the past 24 hours. Each user is displayed with their avatar and their username, with only 1 click away from their Twitter.com profile. With this widget, you can show your latest tweets on your website. Create your own widget with its great customizability. Broadcast your posts to Twitter and Facebook directly from the WordPress post page. 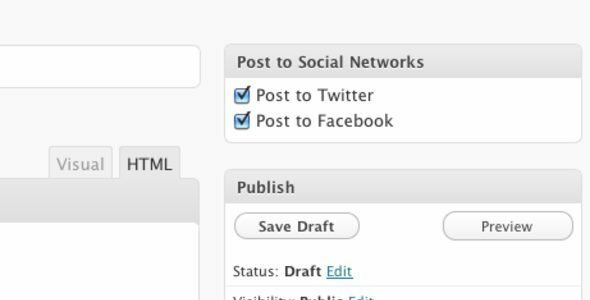 – Automatically post to Twitter and Facebook when you publish your post. – Checks for already-published status. – Select which or both social networks to post to on the post page. – Bit.ly support with custom credentials. – Custom Twitter and Facebook credentials. You will find in the package the WP integration package. Now you can use tuitting on WordPress, having the very same features, but completely integrated with your WordPress Theme and working with all the WordPress features! tuitting is an extremely powerful tool, completely powered with AJAX and PHP . It gives to each member of your Website the possibility to immediately Send or Schedule Unlimited Status Updates for Unlimited Facebook Accounts, Facebook Pages and Twitter Accounts. 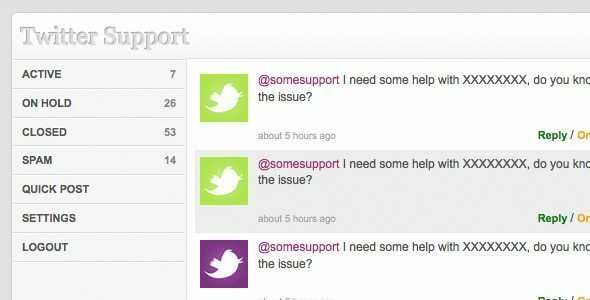 Twitter Support grabs incoming tweets to your account and organises them based their status, such as ‘Active’, ‘On Hold’, ‘Spam’ and ‘Closed.’ This app is primary for those who run a Twitter support account for their business and offers a simple method of management, so that it ensures everyone gets a speedy response. When you reply to a customer’s tweet it automatically marks it as been dealt with, so you won’t have to sift through masses of tweets to make sure you’ve replied to them all. Active tweets are refreshed every 60 seconds in the background and are added to the list, so need to to manually refresh. Settings control. Ability to edit admin username and password, Twitter username and password without editing configuration files. Automatic link generation – Displays click-able links in each tweet.